From time to time, the renewable energy discussion is, well, renewed and this is a good occasion to discuss some aspects. To review: on SLB I have opined that the US energy supply for electricity will undergo a fundamental transformation within the next 20 years as economic coal supplies are consumed to exhaustion. The replacement for the coal-fired power plants will be from natural gas and renewables, primarily wind turbines. It is notable that coal provides almost 40 percent of the US electricity at this time. There remains approximately 20 billion tons of economically mine-able coal in the US, and the annual consumption is just under 1 billion tons per year. Thirdly, I have opined here on SLB that the future of electrical utility grids will be ones that do not have slow-moving (or stubbornly NOT moving) baseload generation from nuclear plants and baseload coal plants. In fact, a grid will have substantial, even insurmountable, problems with too much baseload. That assertion is very much confirmed in the discussion below. A recent post and comments at Dr. Judith Curry's blog, ClimateEtc. discussed the supposed litany of disasters that await any society that installs non-rotating electrical generators such as wind and solar. I have watched and read many such articles on ClimateEtc in the past couple of years, and generally have not commented. I could be wrong, but it appears to me that most of those who comment there are anti-renewable energy, and pro-nuclear energy. I look to see if their evidence and arguments have any merit, or if they are carefully chosen to ignore substantial evidence to the contrary. Not being an electrical engineer, but having had a few electrical engineering courses in undergrad, and being quite knowledgeable on nuclear power and many other forms of electrical power generation, I write on energy issues from time to time. I also make speeches on this. It is actually quite easy to look up public-domain data and publications to determine what is really happening in electrical energy production. In fact, data on electricity has been collected and published in great detail over very many years. At one time, the electrical utility industry was one of the very largest, if not the largest, enterprises in the United States as measured by capital invested. It requires an incredible amount of money to build the power plants, the transmission lines, the power substations, and the distribution lines to individual consumers. Still more capital is required to mine the coal, extract the natural gas, and build the nuclear fleet. We note here that no capital is required to purchase the wind, nor the solar, nor the rain that falls into reservoirs for hydroelectric dams. Still more industries are supported by the electrical utility, including metals for steel, copper, and aluminum, cement and concrete, plus insulators and insulation. The railroads devote a significant portion of their assets to moving coal to power plants, and making the return journey empty to the mines. The natural gas industry also devotes a significant portion of their assets to piping natural gas to the power plants. It is important, therefore, for information on the electrical generation and distribution industry to be collected, analyzed, and made available. One such recent report is cited below, that discusses the issue of integrating wind-generated power into the electrical grids in the United States. This is from a most authoritative source, not some rubes out in the hills sipping their moonshine. This is from NREL, the National Renewable Energy Laboratory. "The past 15 years of wind integration experience has demonstrated that flexibility is the key to successfully and efficiently integrating wind energy. Large penetrations of wind energy will necessitate steeper ramp requirements from dispatchable generators and demand-response sources, require lower minimum generation operating levels than are required today, and increase the amount of reserves necessary to maintain reliability levels. Thus, a “flexible” electric power system implies one in which the operator has some combination of agile generators that are physically able and equipped to respond quickly to load changes or an operational environment (scheduling interval, demand response, robustness of electric market, proper institutional structures) that allows quick adjustments to be made to load, or both. Understanding and providing this flexibility, especially at high levels of wind penetration, may be the most critical wind integration issue. Possessing physical flexibility without the institutional ability to access this flexibility may be insufficient. Conversely, possessing institutional flexibility without physical flexibility will also generally be insufficient. To address these operational issues, advanced wind turbine controls can aid the operation of the grid if proper incentives are provided. For example, wind turbines can now provide synthetic inertia, governor response, and regulation service." (all bold portions mine, not in the original). There are four statements bolded above; each is discussed in turn below. 1. "flexibility is the key to successfully and efficiently integrating wind energy." This is entirely in agreement with the assertion that a significant fraction of grid generation should not, and cannot, be nuclear baseload power. There are some assertions that modern nuclear plants no longer must operate as baseload, but can ramp up and down as do some coal plants and natural gas plants. Yet, as I have also written, such ramping capability in a nuclear power plant is costly, it adds capital cost and adds wear and tear on the plant that impacts safety and long life. In short, it makes a bad situation worse. 2. "has some combination of agile generators that are physically able and equipped to respond quickly." This is more of point 1 above, showing that uncompromising baseload nuclear plants are not the power system desired. Agile is the opposite of a nuclear power plant, which run at 100 percent of capacity day in and day out. Never mind that the grid demand is reduced at night, other power plants must reduce their load, but never the nuclear plant. The agile plants are natural gas-fired. 3. "providing this flexibility, especially at high levels of wind penetration, may be the most critical wind integration issue." 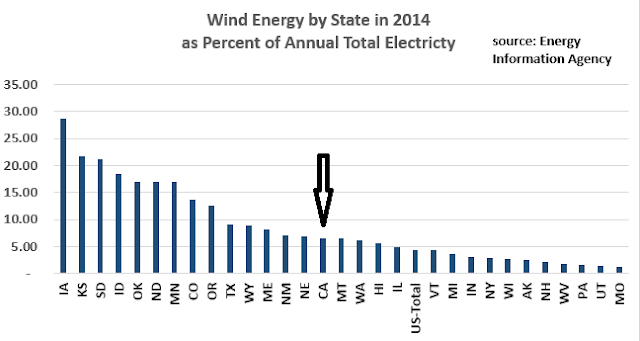 This point is for high levels of wind penetration, such as those states in the US' Great Wind Corridor including Iowa, Kansas, and South Dakota (see chart). Note that this chart shows the annual averages. On a daily, and instantaneous basis, the percentage of wind is much, much higher. The California data shows only a bit more than 6 percent wind annually, but was recently 13 percent on an hourly basis for several hours. It is instructive that the California grid did not crash, did not have a blackout, but ran just fine. 4. "wind turbines can now provide synthetic inertia, governor response, and regulation service." This point is crucial to rebutting the central claim of the ClimateEtc. post, that grids are vulnerable to high penetrations of wind energy because certain grid characteristics that provide stability with rotating generators are inadequate, or not present, when wind and solar input energy to the grid. An authoritative body, NREL, assessed the current state and lessons learned from actual experience with wind energy integration into grids in the US over the recent 15 years. The conclusions include non-responsive baseload plants are not desirable, instead, agile load-changing plants are required. In addition, modern wind turbines can and do provide some of the grid-stabilizing attributes that will allow high levels of wind energy on a grid. These are entirely in accord with the conclusion of my earlier SLB article: "I suspect that part of the California success is not having too much nuclear power on the grid, with its unyielding requirement to run at baseload (flat out at all times), whereas California has much more tolerant gas-fired power plants to slowly increase and decrease their output as the demand requires." I would also like to point out that electrical power is highly regulated, and any power plant additions (no matter what form) are carefully considered before approval. Part of that consideration is the impact on grid stability and reliability. For those who are anti-renewables, there is very little to worry about. The grid will be fine.